How Do Plug-in Hybrid Electric Cars Work? Plug-in hybrid electric vehicles–known as PHEVs–combine a gasoline or diesel engine with an electric motor and a large rechargeable battery. Unlike conventional hybrids, PHEVS can be plugged-in and recharged from an outlet, allowing them to drive extended distances using just electricity. When the battery is emptied, the conventional engine turns on and the vehicle operates as a conventional, non-plug-in hybrid. Click to enlarge. Driving on electricity offers huge environmental benefits. Because they can run on electricity from the grid—and because electricity is often a cleaner energy source than gasoline or diesel—plug-in hybrids can produce significantly less global warming pollution than their gas-only counterparts. They don't emit any tailpipe pollution when driving on electricity, and they gain fuel efficiency benefits from having an electric motor and battery. Since they use less gas, they also cost less to fuel: driving a PHEV can save hundreds of dollars a year in gasoline and diesel costs. To take advantage of plug-in hybrid vehicles, drivers need access to parking and a place to plug-in, though a regular 120V outlet is usually sufficient. And since most PHEVs are passenger cars, prospective buyers shouldn't regularly require space for more than five occupants, and they shouldn't need to tow. PHEVs combine the fuel-savings benefits of hybrids with the all-electric capabilities of battery-electric or fuel-cell vehicles. Plug-in hybrid vehicles combine a gas engine with an electric motor and battery. While not all models work the same way, most plug-ins can operate in at least two modes: "all-electric," in which the motor and battery provide all of the car's energy; and "hybrid," in which both electricity and gasoline are used. PHEVs typically startup in all-electric mode, running on electricity until their battery pack is depleted: ranges vary from 10 miles to over 40. Certain models switch to hybrid mode when they reach highway cruising speed, generally above 60 or 70 miles per hour. The electric motor and battery help PHEVs use less fuel and produce less pollution than conventional cars, even when in hybrid mode. Idle-off turns off the engine while idling at stoplights or in traffic, saving fuel. Regenerative braking converts some of the energy lost during braking into usable electricity, stored in the batteries. And because the electric motor supplements the engine's power, smaller engines can be used, increasing the car's fuel efficiency without compromising performance. Different models of plug-in hybrid electric vehicles may also have different drivetrains, the mechanical components that deliver power to the driving wheels. Learn about the implications of different hybrid drivetrains here. Learn more about electric vehicle technology here, including its potential as a nationwide oil-saving solution. Consumers Union and UCS found that 42 percent of U.S. households could use an electric vehicle. 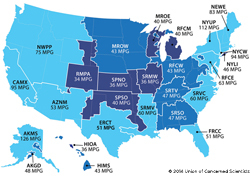 View emissions of specific EV models where you live.